I had occasion a few days ago to revisit a subject that I first photographed about 4-1/2 years ago. I didn't get exactly the same angle of view in both pictures, but I think they're close enough to appreciate the similarity. 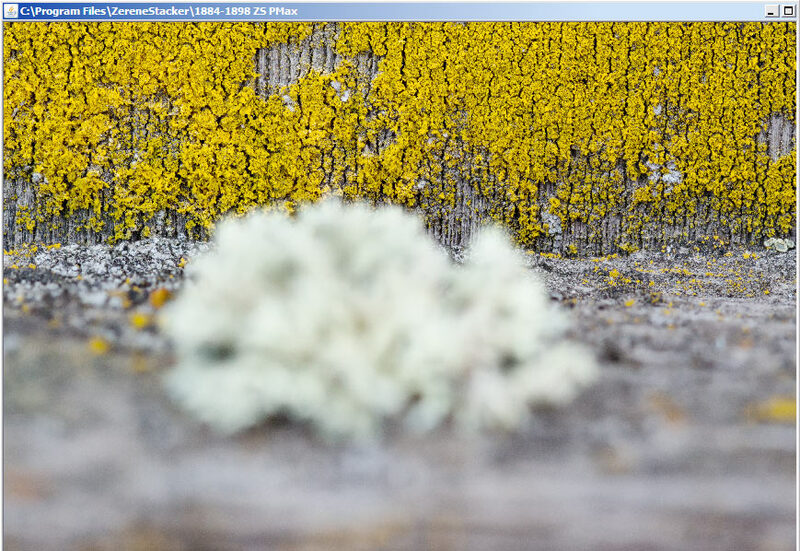 Considering that the field of view here is about 35 mm, yep, it really is true that lichens grow about 1 mm per year. I was saddened to see that the bright red heart-shaped lichens on the right side of the old photo had disappeared in the meantime. Those were primarily what I had gone after, and it was only when I discovered "Oh no! Gone! " that I shifted attention back to the larger more convoluted bluish one. Shot with Canon T1i and Canon 100mm f/2.8 L IS USM macro lens, natural light with artificial shade, ISO 100, 1/100 sec, f/4.5, 76 frames with about 0.6 mm focus step. Zerene Stacker PMax, synthetic stereo at +-1.5%. 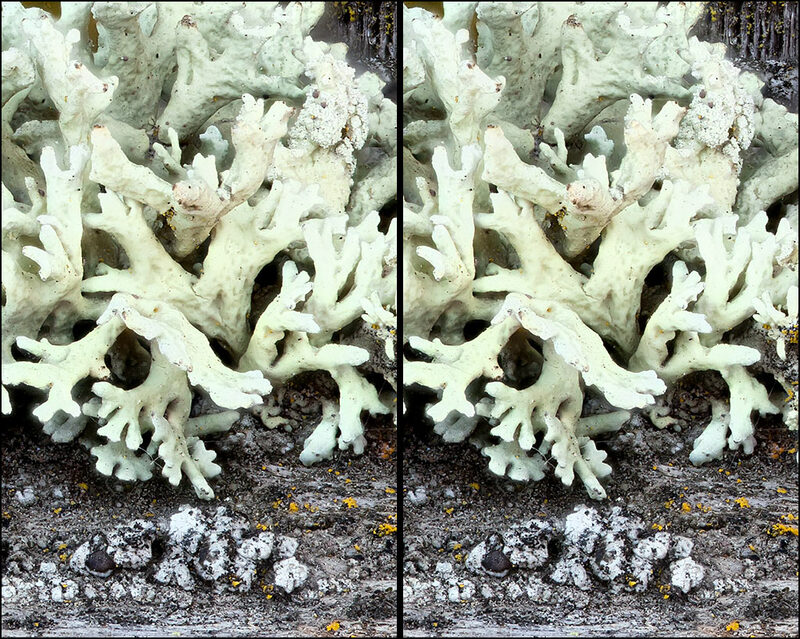 Minor retouching of the stereo crops to eliminate some distracting artifacts.
. . . yep, it really is true that lichens grow about 1 mm per year. What an excellent depiction of lichen growth! Also, a wonderful use of stereo. I recall, some years back, looking at lichens through a stereomicroscope, and wishing I could take pictures that looked like that. This is exactly what you've done here. Is that particular colony really gone? Or just substantially diminished, and not currently bearing two large fruiting bodies? At least the species continues to appear well represented in the vicinity. Would you care to hear about a "goner case of 'gone'"? A few years back, Sam--my botany professor collaborator--and I were working under a grant from a park district, doing research on former farm fields that the park had acquired. During one of our visits, we took some time off from our work and hiked out to a large, high-quality bog on a different area of park property. There is a trail to this bog, and a wooden, dock-like platform that juts out over the water, for observation by park visitors. To our surprise and delight, we found spectacularly diverse and well-developed lichen community, thriving on the railing of this platform. 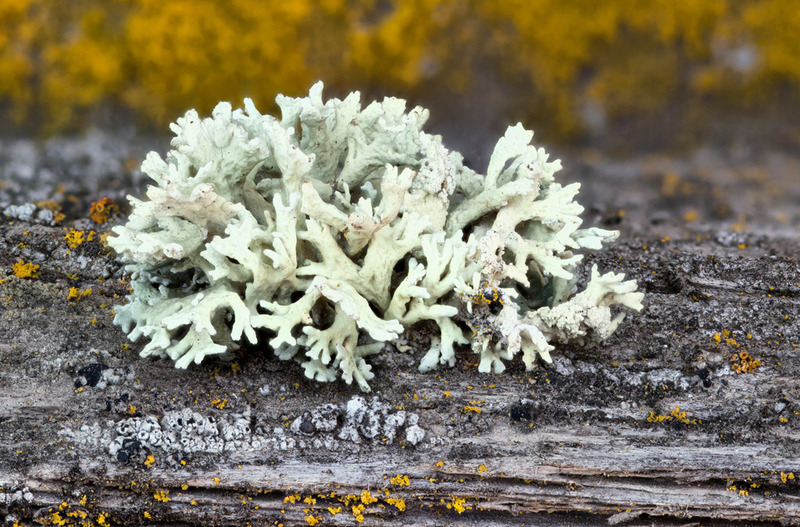 While such a growth of lichen is probably not unusual in your region (Pacific Northwest United States, where the wind blows clean off the Pacific Ocean), it's a big deal in this area of Northeast Ohio. For those who don't know, lichens are sensitive to air pollution. This park is downwind from an industrial city, and the region's lichen flora was wiped out decades ago. That this colony of numerous species had become established, and prospered, was notable. From the size of the larger lichens, it had probably been growing for about 15 years. Sam and I decided that as soon as our grant-work was completed, we would study this lichen colony and see if we could tie it with economic changes in the region, the effect of clean-air laws, and the possibility that birds migrating south from lichen-rich regions to the north perched on the railing--the only perching spot spot for a considerable distance--and seeded it with lichen spores that had stuck to their feet. This would sort of study might prove valuable at several levels. It would likely have been publishable research, at least in a journal with a modest impact factor. About two weeks later, Sam and I were walking the former farm fields with two park officials, when one of us chanced to remark on the remarkable lichen community and its value. The two park officials immediately looked at their watches, and then at one another. And in tandem, they adopted looks of resignation. "What's up?" I asked. "We just sent a man out there with a pressure washer to clean up that platform," one of them said. "It's too late, he's done." I'll post another thought--unleavened and unbaked. Pure conjecture. As commonly described, lichens are fungi that discovered agriculture of algae. 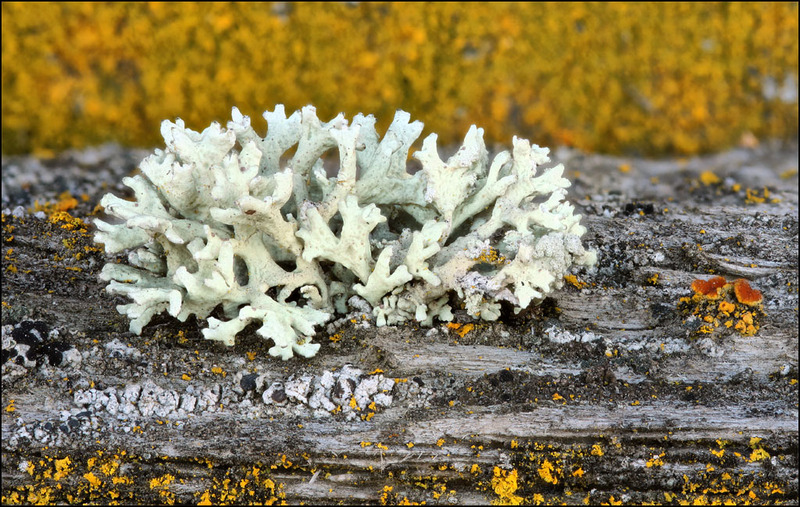 Every lichen is a mutualistic pairing of a fungal partner with an algal partner. 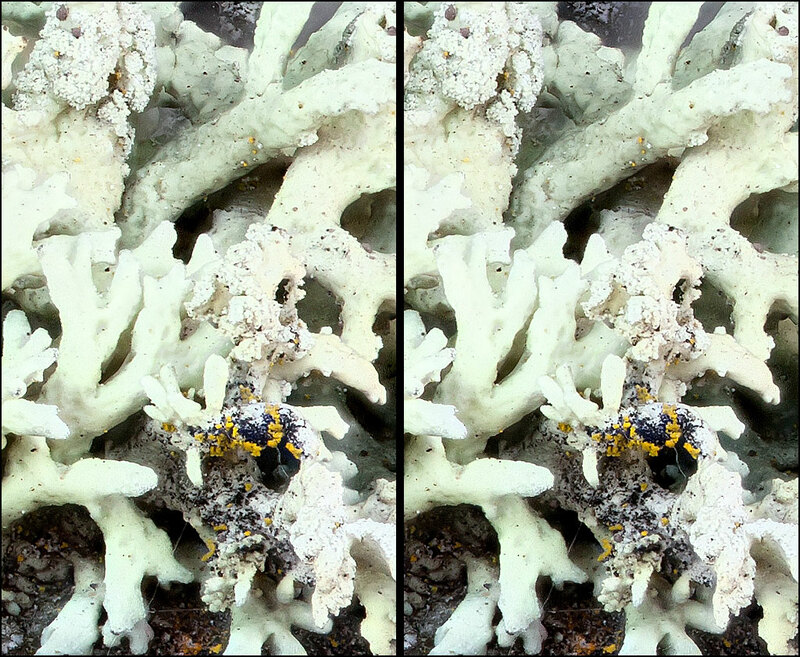 The fungi involved in lichens are disparate, but their algal partners are a limited group. In all likelihood, these symbioses were probably "discovered" and selected-for multiple times by natural selection, with each incidence independent of the others. While there are numerous kinds of fungi involved in lichen formation, there are relatively few species of algae that these fungi employ. In every lichen "species," (really a species pair--one fungus with one alga) a particular fungus provides a particular alga with a structure on which to live; in return, the fungus takes carbohydrates from the alga. Let me conjecture: Many non-lichen fungi fruit moderately on an annual basis. But if the fungus senses that it is in distress (for example, its host tree is injured or has died), it may initiate an "escape fruiting," in which it translocates proteins, sugars, and other resources into spore-producing structures that help it disperse and seed. One result is a huge and heavy production of fruiting bodies. Another is a dramatic weakening of the fungal colony, toward the point of its death. Such "escape fruitings" strike me as underdescribed in the literature of fungi, although, in my experience, they clearly and dramatically occur. And among lichens, any occurrence of escape fruitings is even more obscure. This said, I suspect that it happens. Chris, thank you for the additional information and the memorable story. Is that particular colony really gone? Or just substantially diminished, and not currently bearing two large fruiting bodies? 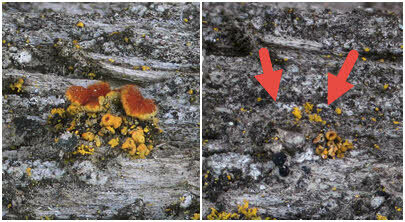 I'm quite naive about lichens, and I did not recognize the large red heart-shaped things as fruiting bodies. If that's what they are, then perhaps there is another simple explanation: the earlier session was shot in February, in the middle of our cold wet season, while the current session was shot in late July after many weeks of unusual heat and drought. At least the species continues to appear well represented in the vicinity. Yes, apparently no difficulty there. 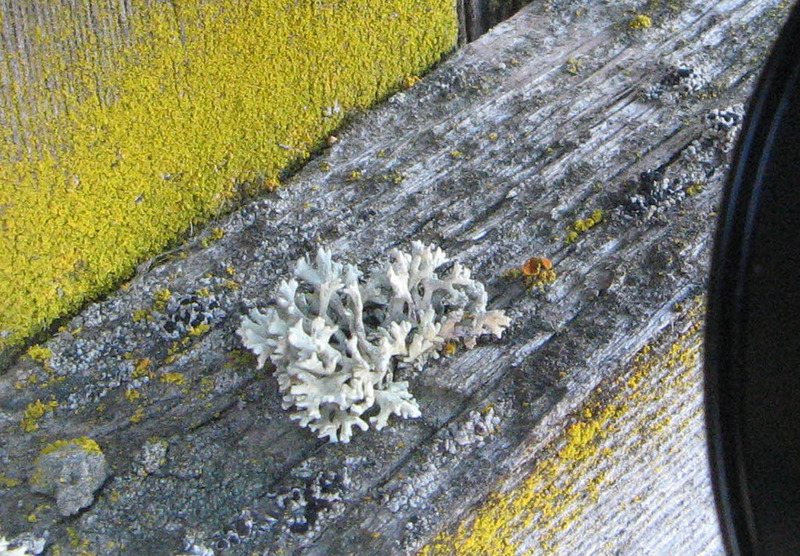 And that brings up another issue: the distribution of that yellowish lichen on the vertical boards of the fence seems to be much different now than it was 4-1/2 years ago. I'm wondering if there is such a thing as lichen that is "short-lived and rapidly reproducing" (in relative terms, of course), so that coming and going is just the way that small yellow stuff works.